← Your Attention Please: Quatch Watch! Sumi is an animal spirit who lives in the mountains of British Columbia. Like many Canadians, Sumi’s background is drawn from many places. He wears the hat of the orca whale, flies with the wings of the mighty thunderbird and runs on the strong furry legs of the black bear. Sumi’s name comes from the Salish word “Sumesh” which means “guardian spirit.” Sumi takes his role very seriously. He works hard to protect the land, water and creatures of his homeland. 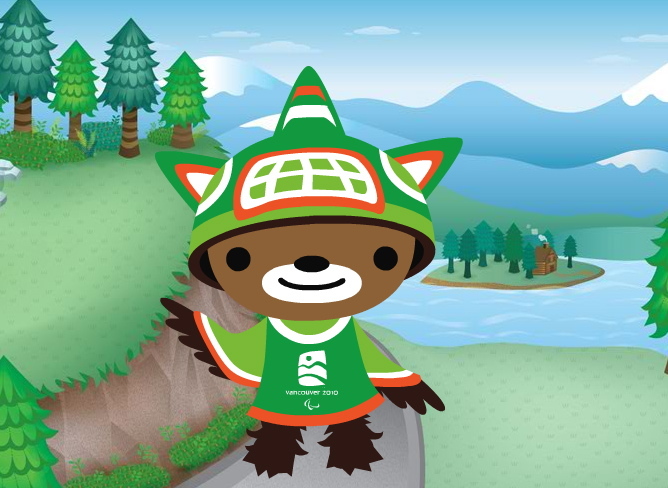 Sumi is a great fan of the Paralympic Games. He’s determined to learn all the sports, so he can play and race with his animal friends all winter long. Unfortunately, Sumi is sort of a third wheel to Quatchi and Miga, trailing both in a mascot popularity poll. In another poll, he actually placed fourth, behind Quatchi, Miga, and “mascot sidekick” Mukmuk (more on him later). Sumi’s still pretty cool, however, or else these schoolkids wouldn’t be doing a ritualistic Sumi Chant, nor would there be this fun Soaring Sumi video game. Besides, any pal of Quatchi is a pal of ours. This entry was posted in Uncategorized and tagged Meomi, Miga, Quatchi, Sumi. Bookmark the permalink.